At Christmas time the seasonal blooms in radiant reds and purest white mix with delicate foliage to create the perfect yuletide present. Are you looking for plants for Christmas gifts? At SerenataFlowers.com, you can choose from a wide range of xmas plant gifts available with free next day delivery anywhere in the UK. Get Christmas plants delivered to your loved ones in the UK, in a matter of few clicks online. SerenataFlowers.com is an award-winning online florist offering you a convenient option to order your floral gifts from the comfort of your own home. Simply select your preferred festive plant and proceed to checkout in three easy steps. 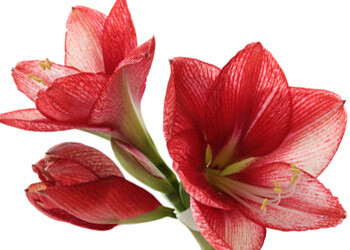 With SerenataFlowers.com, you can arrange Christmas plant delivery any day of the week, including Saturday and Sunday. Our plants come with FREE next day delivery which is available throughout the festive season. No matter how big or small your plant delivery might be, we will always ensure it arrives on time. You will also receive detailed notification about the dispatch and delivery of your plant and a free greeting card to share your festive wishes. Whether you are sending xmas plants by post or courier, you can rest assure they travel safely packed and will be delivered in excellent condition. Spread the festive cheer this December by sending one of our long-lasting traditional Christmas plant gifts. Let us deliver Christmas plants like Poinsettia or Amaryllis straight to your loved one's door to decorate their homes with a bit of Christmas magic. Choose a traditional Christmas plant or opt for more festive version of our bestselling house plants like Christmas Orchids, Campanula or vibrant red Azalea. 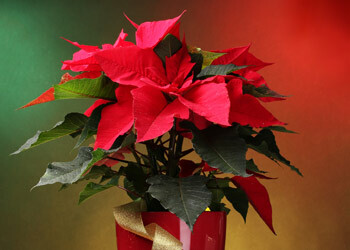 The sweetheart of the festive season - vibrant Poinsettia. Fragrant display for your festive table. Blushing red roses are a wonderful way to celebrate this festive season. Christmas plants are not our only specialty. 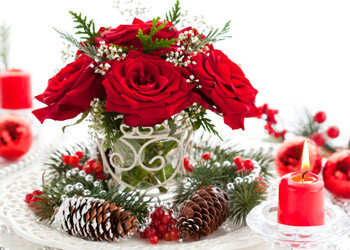 At SerenataFlowers.com, you can shop a whole variety of Christmas gifts including Christmas flowers and Christmas wreaths, all with free delivery.